Kitchen shears are indispensable and are an important part of any well-equipped kitchen. But if you're using them just for cutting open a package of bacon or trimming a piece of kitchen twine, you're missing out. Here are 10 ways to use the kitchen shears that you might not have thought of. Just be sure that if you use the shears directly on food, that you wash them thoroughly with hot water and soap, before and after you use them. Put away that hard-to-clean pizza wheel, and instead just snip your pizza into pieces with a clean pair of shears. Shears are especially useful for cutting slices of pizza into smaller pieces for little kids. Take your shears out into the garden to cut what you need for a recipe. And, after you've rinsed your herbs, you can use the shears to chop them into bits right into your recipe. To make basil chiffonade, stack a few basil leaves, roll them lengthwise like a cigar, and snip little pieces off the roll. Using shears instead of a boning knife gives you more control while cutting a whole chicken into pieces. Good shears can even slice right through bones and joints. Once you've rolled out your pie crust and eased it into the pie pan, use shears to trim the excess dough from around the edge, then tuck the ends underneath and use your fingers to crimp the crust into a pretty edge. Shears make quick work of cutting the ends off green beans or snipping the toughest bit off asparagus. 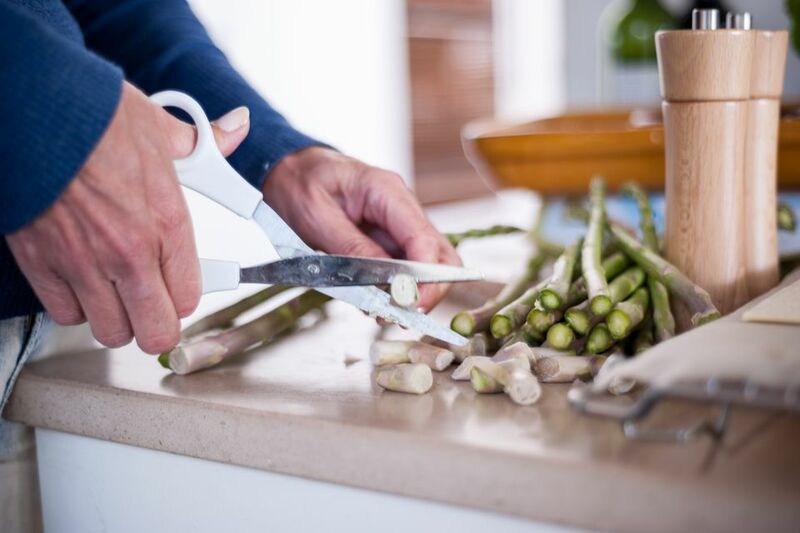 With asparagus, break the first piece by hand to see roughly how much to cut off the rest of the bunch, then use your shears to trim a few at a time. As you're rolling fresh sheets of homemade pasta through a pasta maker, use the shears to cut spaghetti or fettuccine noodles into manageable lengths, or to cut filled ravioli into pieces. Shears are better-suited than knives for this purpose, as the cutting can be done right in the air, in the case of long noodles, and, with ravioli, won't press the dough into the cutting board. Brush flour tortillas lightly with oil, snip them into wedges with shears, spread them on a baking sheet and bake them for 10 minutes or so in a 350 F oven to make crispy tortilla chips. Or, after you've made a quesadilla, use shears to easily cut it into wedges. If you have a jar or can of whole preserved tomatoes, and you need them chopped into pieces, the neatest way is to plunge a pair of clean shears right into the pan and snip away! Move the shears around to make sure you cut up all the tomatoes, and use the tip of the closed shears in a stirring motion to "feel" for big chunks. Be sure to rinse the shears off right away for easier cleaning. If you need to cut bacon into smaller pieces or lardons (tiny elongated pieces), shears can do this neatly and easily, with more control than a knife. They're also great for cutting prosciutto, deli meats or other thinly sliced meats into pieces, such as to use as a topping or in an appetizer. The safest and easiest way to remove the spiky ends of artichoke leaves before cooking artichokes is to use kitchen shears. Snip the prickly end off each leaf, then turn the artichoke on its side on a cutting board and use a chef's knife to slice off the ends of the densely packed leaves at the very top.